We thank you very much for your kind donation. With out you their will be no Puffy Paws Kitty Haven. Every time you donate you are giving the gift of life for the kitties. Please accept this as our personal thank you at this time. We are very sorry at this time, as it is almost impossible, to send out a personal thank you. It is Chrissy and I, running the daily operation of Puffy Paws Kitty Haven. Let me fill you in on the details. The very sad fact of the matter is that it's has been my wife and I taking care of the 200 Special Needs kitties by ourselves for a very long time. 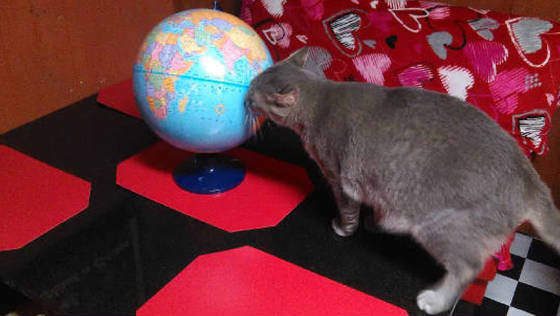 My wife and I are only two people, running Englewood, Florida's "World's Greatest Cathouse." 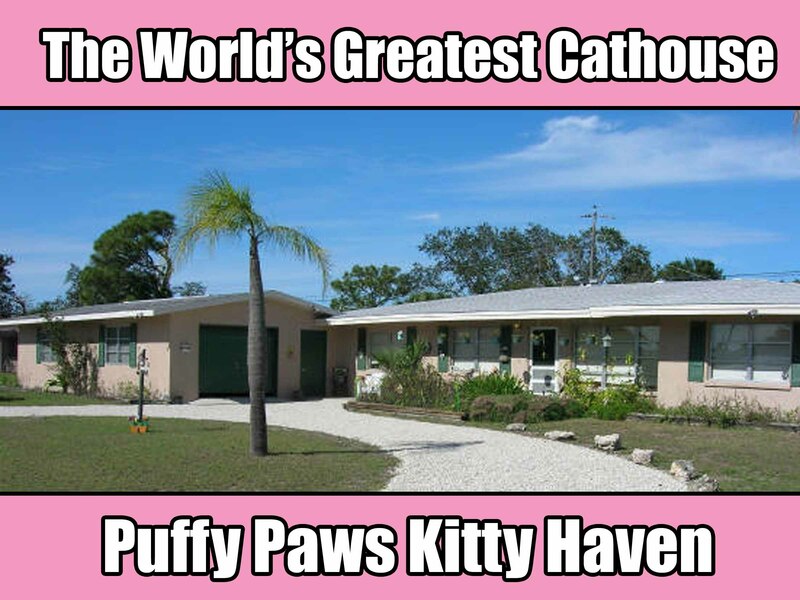 Puffy Paws Kitty Haven is a 501(c) (3) non-profit, no-kill cat hospice & rescue specializing in providing quality and loving care to special needs cats. We have been begging this community for help for years with adoptions , PR, and fund-raising events. While the Humane Society and other rescue groups in the area enjoy paid employees and a host of volunteers, we do not. 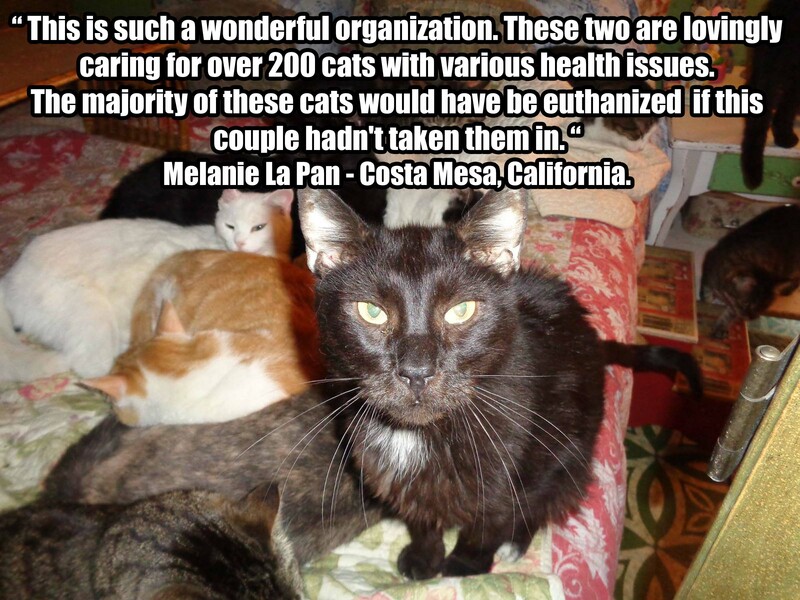 We do not get paid; 100% of all donation goes to the kitties and the operating expenses. Are books are open to the public. It cost well over $30,000.00 a month to run Puffy Paws Kitty Haven. $41.09 a hour every single day, 365 days a year. Funds are like the tide over here at Puffy Paws. Funds in and funds out. Last year in 2016: $419,065.80 was donated. Of the $419,065.80 - $401,101.23 of that was donated via PayPal, by the kitty lovers of the world. The remaining amount was donations via checks. The priority of incoming funds are in this order, the kitties daily needs, cat food, vet care and operating expenses. Puffy Paws Kitty Haven believes in 100% transparency in all of our dealing. Chrissy and Rick do not get paid. The Kitties Need Cat Food, Monthly Operating Expenses, Kitties Daily Needs, and Veterinary Care pages are designed to let the whole world know were their donations go and why and when they are needed each and every month. My wife and I takes care of the special need & unwanted kitties together. We still have to work 16 -20 hours day because Sarasota Code Enforcement banned all traffic at the Haven. Chrissy hauls in 600 pounds of cat litter in the Haven daily & takes it back out. She wash over 20 cat litter boxes daily. Every four hours the kitties are feed at 20 feeding stations, she vacuums & mops and dust daily. Chrissy gives out meds. She groom the kitties. She tends to the sick ones. She runs to the Vet and the Publix every night for the kitties daily supplies . Chrissy does this this day in and day out. She does the work of a paid staff of 10. My job is to raise the funds to keep the doors open. On most days I work up to 15 - 20 hours a day. In addition to raising the funds , I run the Business Center. I run to the Vet. I'm our Web Master. I do all the graphic art work. I update on fb everyday. I pick up the kitties daily litter from Walmart. I pay the operating expenses . I put out the SOS's for help. I put out all the fires that pop out daily. I'm my wife's venting post. I'm the fixer. I’m in a fight for the kitties lives. If I fail at raising the funds needed to take care of the 200 kitties under our care there will be no other option but to close down. What choice would we have ? A whole Cat Hospice will be wiped out and only painful and sad stories will be told because I could not round up the World Wide awareness and financial help these beautiful cats deserve. When people want to volunteer and find out that they can not help with the kitties at the Haven because of the ban, they do not want to help out in other areas and move on but we do need folks to help us with the thank you letters and emails. But it is not happening right now. We have improvised., adapted and overcame these human obsoletes by telling the truth of our situation. With out your support we could not do what we do and we will always be eternally grateful. When we received a donation on-line it is my job to safe guard all the personal information that is sent. Puffy Paws Kitty Haven does not store, nor does it have access to, your credit card information, bank account numbers, or other account data sent through Pay Pal. So the burden falls on me. This is very time consuming in sending out a personal thank you, for each donations received. It evolves many hours in gathering the emails from Pay Pal to send out a personal thank you. I have a tremendous amount of guilt every single day because I do not have the time to send out a personal thank you for each donation received because I’m trying to keep the doors open. And for this I'm sorry. One day I will get help in other areas so I may send out personal a 'Thank You". But until that day comes , please know that we appreciated and are very grateful for every single donation that you send in to help the kitties. We can not do it with out you. Sadly enough time is my enemy. 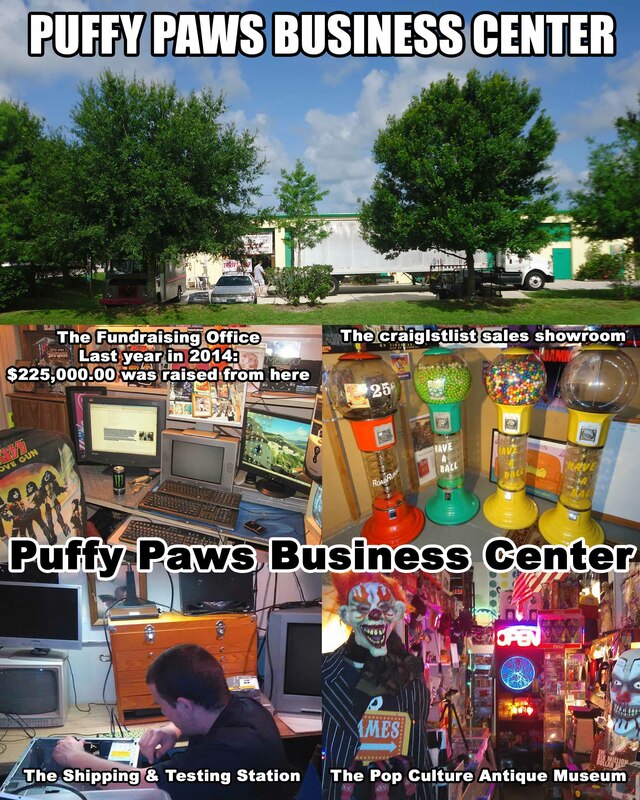 I only have certain amount of time to raise the funds daily to keep the doors open at Puffy Paws and I hate this fact. I pray for your understanding and forgiveness if I offended you.